​LSH Projects are an established Bromley based builders with over 30 years of experience. Offering smart interior and exterior solutions. Working to our best all the time, using both traditional and modern methods providing a fast, friendly and professional service. 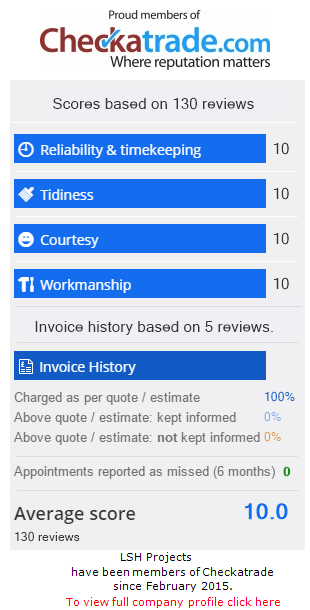 Less like a business and more like a partner, helping customers to deliver their goals on-time and on budge treating and leaving your property like we would my own. Whatever your home needs call Ian today. Bromley,Bexley,Blackheath,Chislehurst,Sidcup,Orpington,SouthLondon,Greater London,KentLSH Projects are an established Bromley based builders with over 30 years of experience. We offer smart interior and exterior solutions. We work to our best all the time, using both traditional and modern methods providing a fast, friendly and professional service. We are less like a business and more like a partner, helping our customers to deliver their goals on-time and on budge. We are proud of the work we provide to our customers, treating and leaving your property like we would our own.